The Rotary Club of Darien Foundation is raising money for a sister Rotary Club in Kenya to build toilets for elementary schools there. The link between the two groups: former Darien resident Kate Crowley. 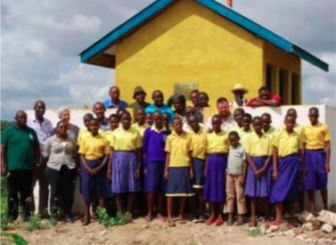 Children and others at the school pose in front of one of the toilet blocks. An effort to raise $1,500 for the project through the ImpactVine.org website run by the Community Fund of Darien raised 100 percent of its goal on Saturday, Nov. 4. From 7 to 8:30 p.m., Thursday, the Rotary Club will have a meetingto update Club members and other donors of the progress made, and show how the Impactvine web page works. The meeting takes place at HSBC Bank, 151 Post Road, Darien. 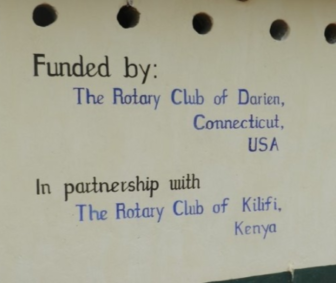 The Rotary Club of Darien is partnering with Kate Crowley (former Darien resident) of the Rotary Club of Kilifi, Kenya to raise $1,500 on The Impact Vine to build toilets at primary schools in rural Kenya. The Darien club will contribute an additional $1,000, and we are applying for a Rotary District matching grant of $2,500 for a total fund raise of $5,000. Your contributions will be more than tripled! 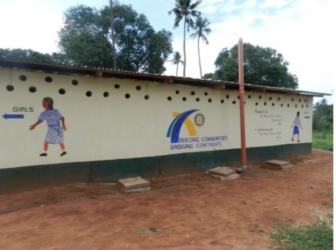 The Rotary Club of Kilifi has been working for a number of years to bring toilets to primary schools in Kenya’s Ganze sub-county. Primary school enrollment numbers have surged in Kenya since the introduction of free primary education in 2003, and this has placed a severe strain on school infrastructure. will provide health education materials for all students. Each block has six toilets and serves about 150 students. 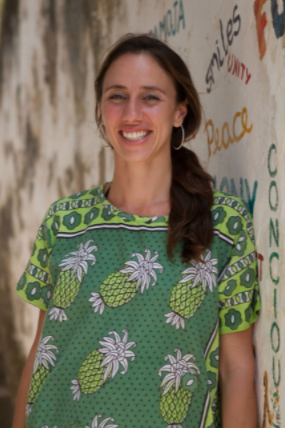 Originally from Darien and a long-time visitor of our club, Kate is the chairperson of the Kilifi club’s water and sanitation committee. Her committee has built 11 blocks of toilets already, including one sponsored by the Rotary Club of Darien in 2012. 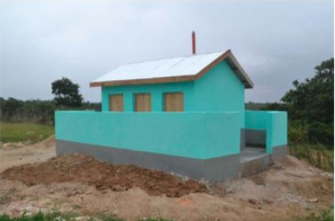 Former Darien resident Kate Crowley, who was in the Rotary Club here, has been working with the Rotary Club in Kilifi, Kenya to build more toilets for the school population after it rapidly grew in recent years. We were all very impressed with the outcome of our past partnership and were delighted by updated photos of the clean and well-maintained block of toilets that Kate showed us on a recent visit to our club. Ensuring adequate sanitation at schools is a basic human right and a key component of quality education. When schools have ample clean toilets, the spread of disease is reduced, and student attendance levels are much higher. This is especially true for adolescent girls who often miss school when they are menstruating. Clean toilets with adequate privacy is a crucial part of making sure that all students can attend regularly. Join us in supporting this project! The holidays are right around the corner … remember the excitement and fun of opening presents with your family? We want to make sure every child has this same wonderful experience this year so we’re raising money to purchase two dozen more children’s toys for Person to Person’s Holiday Toy Store. TheImpactVine.org website that's been raising funds for projects proposed by nonprofit organizations in Fairfield County is now inviting individuals to create projects supporting nonprofits. "We invite everyone to participate, visit the site, create a project supporting an organization you’re passionate about, and share with others!” said Susan Serven, project director of The Impact Vine.